Network Flags are used in RUL 0x10000000 (RUL0), RUL 0x10000001 (RUL1) and the Individual Network RULs to signify network layouts. Their format is different for each of these files. They are entered in the 0xSSEENNWW syntax with two digits per direction for RUL0 and RUL1 files. They are entered as one- or two-digit numbers in W,N,E,S format for the Individual Network RULs. When used in the Individual Network RULs, you can omit the leading zero (if present) from the Network Flag (i.e. 04 is simply 4). 01 - Left at 45 degree angle (diagonal connection). 03 - Right at 45 degree angle (diagonal connection). 04 - Shared median for 2 tile wide networks. 11 - Off center "blend" sloped connection for left angled 1 becoming straight 2. 13 - Off center "blend" sloped connection for right angled 3 becoming straight 2. Various other flags are used in rail-type networks. Their definitions are unknown. Take, for example, the image below, representing a tile, with the corners labeled with letters and the sides labeled with numbers. Point E marks the center of the tile. Assume that Side AB is "North" for purposes of this example, remembering that the values in RUL files are given for the North, East, South, and West sides of the tile. Suppose Side AB is the side of the tile for which we are trying to determine the Network Flag. This would be the "North" side of the tile in our example for the purposes of inputting the value into a RUL file. Given such a tile, the game needs to know the vector (direction) the network travels across the tile, and it defines this direction by defining a vector from Point E to some point along Side AB that is a parallel vector to the actual vector of the network across the tile. Once this parallel vector is defined, it is matched up to the corresponding Network Flag, which is then input into the RUL file. Graphically, one could determine the parallel vector by first tracing the direction the network travels across the tile, and then drawing a straight vector passing through Point E that is parallel to the direction of the network. 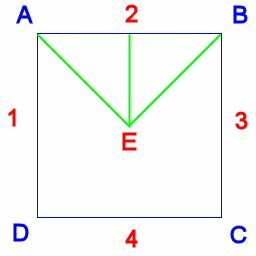 If the parallel vector, starting at Point E, crosses Side AB of the tile at Point 2, tracing the line E2 across the tile, then it would be a straight connection, and the appropriate flag for Side AB (the "North" side in this example) would be 02. If instead the parallel vector travels at a left diagonal from Point E and crosses the edge of the tile at Point A, then it would be a diagonal 45 degree left connection, and the appropriate Network Flag would be 01. If the parallel vector does not cross Side AB of the tile at all, then the Network Flag would be 00, for no connection. One would also need to then determine where this same parallel vector through Point E crosses the other three sides of the tile, and assign the appropriate Network Flags to each side, remembering of course that the direction is defined relative to a new point for each side of the tile. For example, while Line E2 was straight (Flag 02) for the "North" side of the tile, Line E1 would be straight (Flag 02) for the "West" side of the tile. The four Network Flags would then be input in to the RUL file in the appropriate format. The point where the parallel vector crosses Side AB of the above example can also be measured as the corresponding pixel along that edge of the tile texture. The following tables show you, for a tile defined as above with a road running across it, the corresponding Network Flags for various pixel positions. The pixel positions are given for where the left edge, centerline, and right edge of the network cross the edge of the tile. The following pixel position is based on the 128 pixel wide zoom 5 textures, with pixel points 0-127. Also, the pixel values might be off slightly due to anti-aliasing in the textures. Remember that "to the right" and "to the left" are relative to the tile edge with the camera facing perpendicular to the tile edge. Consequently, as you rotate the camera, you have to keep in mind what direction you are trying to define. North: 01 is to the left, 03 is to the right. East: 01 is up, 03 is down. South: 01 is to the right, 03 is to the left. West: 01 is down, 03 is up. This page was last modified on 30 October 2012, at 19:14.